"Thorough data analysis is essential for the synthesis of successful strategy." Profile: Although much admired for his dedication, bravery, skill and intelligence, Computron is an unfortunate example of being too technologically advanced for his own good. Centuries ago on Cybertron the five Autobots who comprise Computron - Afterburner, Nosecone, Strafe, Lightspeed and Scattershot - agreed to apply the new engineering science of mechanical combinatics to themselves so that they could unite to form a super-Autobot to more effectively combat the Decepticons. 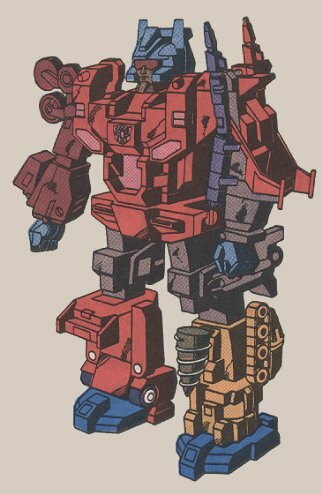 Scattershot, however, insisted that their combination be better than anyone else's, that the contribution of each of the five component Autobots to the whole be maximized in every way. The result was not what anyone expected: Computron was created, but as he was programmed to thoroughly and exhaustively analyze the input of each of the five who comprise him, he takes several minutes to form a consensus opinion and make a decision. Any decision. Of course, without exception, the decision he makes is the right one, but very often it comes too late to make a difference. He genuinely regrets when this happens, and feels even worse that he's unable to do anything to change it. Nevertheless, he is well known for his sharp mind, and respected for it. He chooses every word with great care and precision and takes great pride in knowing that when Computron talks, everybody listens. Abilities: Computron possesses awesome strength. He can lift up to 240 tons. He has excellent radar and communications capabilities. He possesses extensive data storage and data processing capacities. He is armed with Scattershot's automatic acid-pellet gun, which shoots capsules containing a highly corrosive liquid that explodes on impact. Weaknesses: Slow decision-making is Computron's most glaring liability. He sometimes overheats and breaks down when he attempts to process more data than he can handle.